When we set out to create a recipe from our way-too-delicious Organic Quinoa Bread we didn’t want to slap together just any ordinary sandwich, or salad, or salad on a slice of bread (debate this amongst yourselves), we wanted to throw in all the food groups. Vegetables, fruit, protein, grains, and of course that most important of food groups, amazing taste. Yes, it’s a food group. At least it is now. Face it, lots of bakeries leave it out – we heaped it on, thick. Enjoy. In a food processor, combine chickpeas, 1 tbsp. olive oil and plain Greek yogurt. Pulse until mixture reaches the consistency of a chunky spread. 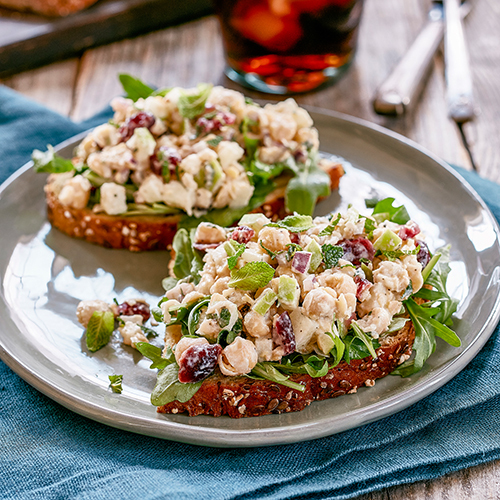 Place chickpea mixture into bowl and incorporate cranberries, green apple, lemon juice, 1 tablespoon of mint, red onion, salt and pepper and mix until combined. Evenly place arugula on toasted bread. Top arugula generously with chickpea salad. Sprinkle with fresh pepper and reserved mint. Serve and enjoy.